New heavy goods vehicle market declines in Q2 2018, falling -9.4% to 10,670 units. 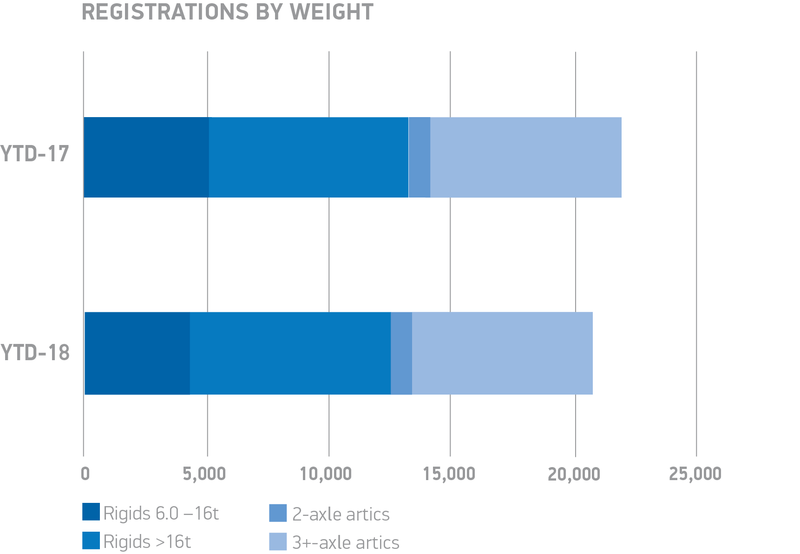 Demand for artic trucks declines -13.2%, while rigids fall -6.5%. 20,455 HGVs registered in first half of the year, down -7.8%, following bumper 2017. 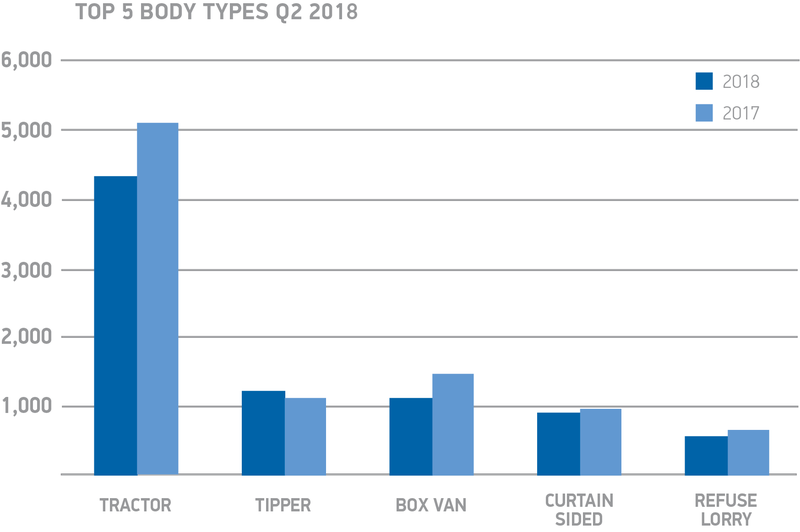 The UKâÂÂs new heavy goods vehicle (HGV) market declined -9.4% in the second quarter of 2018, with 10,670 units registered, according to figures released today by the Society of Motor Manufacturers and Traders (SMMT). The fall follows a downturn in business confidence caused by ongoing political and economic uncertainty and confusion surrounding clean air zones and local regulation. 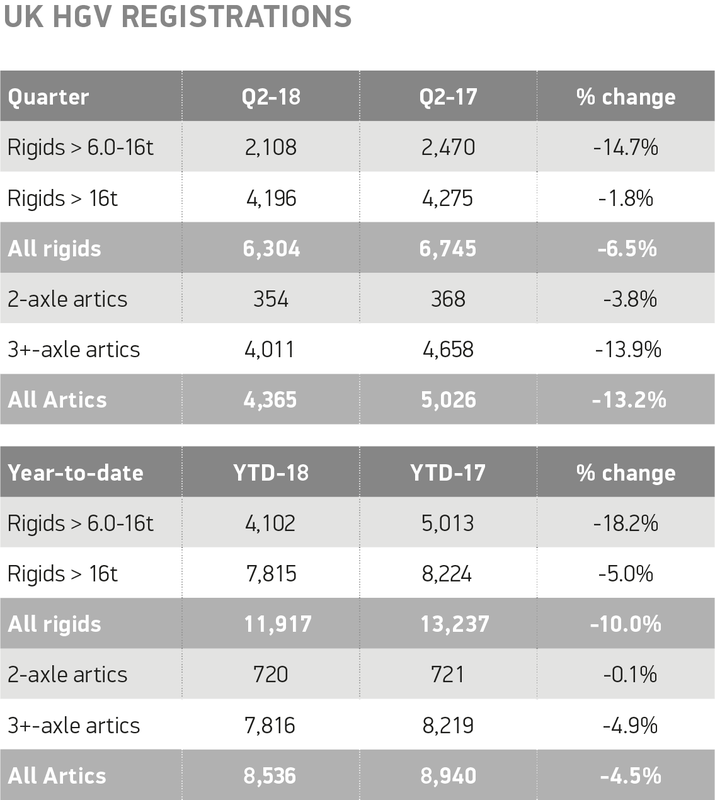 Demand for rigid vehicles declined -6.5% in quarter two, with a -14.7% fall in the >6-16T segment and a -1.8% decrease in the >16T segment. Meanwhile, registrations of artic vehicles also fell, by -13.2% to 4,365 units. Despite a -13.1% drop in demand, tractors remained the most popular vehicle, accounting for more than two fifths (40.8%) of the market. Tippers and skip loaders were the only segments to record growth in the quarter, up 23.7% and 11.6% respectively. Figures for the first half of 2018 painted a similar picture, down -7.8% on the same period, with 20,455 registrations so far this year. However, the decline follows a strong performance in 2017 when HGV demand reached its highest level for the period since 2008. While the fall in registrations follows strong demand in 2017, this quarter marks the fourth consecutive decline for the HGV market. Ongoing political and economic uncertainty, coupled with concern around a patchwork of different local authority clean air zones, has clearly had an impact. We need the right conditions to give operators confidence to invest in their fleets, ensuring this important market can continue to prosper.